Talk about ESD tolerant! 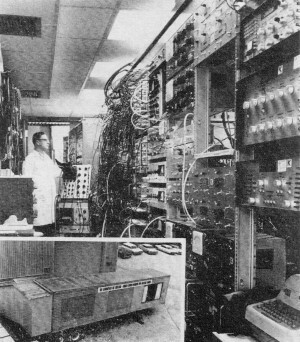 Get a load of that electron beam welding computer memory. Of course, that isn't silicon - it's magnetic core memory, the kind with tiny toroids with 4 tiny wires running through them for the read and write operations. If you want a computer memory that will survive a nuclear EMP, this is your answer. Hook it up to your electron tube computer and you'll be playing Pong while all the other survivors are back to tic-tac-toe with pencil and paper! 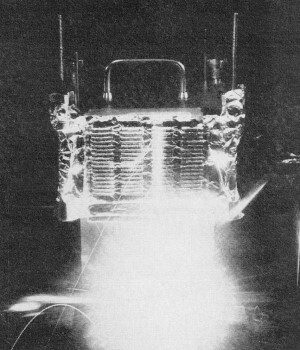 Electron Beam Welds Computer Memory. A sharply focused beam of electrons is being used to perform tiny precision welds on critical electrical connections for computer memory arrays. The beam welder is used to connect the terminals of ferrite core planes with those immediately above and beneath them in the array. Using the electron-beam technique, these precise welds can be done in a continuous operation rather than singly as with conventional welding. The welds produced are uniform and look like ball-shaped nuggets. This makes it easy to spot a poor weld during quality-control inspections. During manufacture, the tips of a column of electrical terminals are automatically and sequentially passed through the electron beam until the entire side of the array has been welded. All four sides of the array are welded in this way. The technique is now being used on the production lines at IBM's Kingston plant. One-Man TV Studio. A new one-man television studio expressly designed for classroom and industrial training was demonstrated recently. The console-size closed-circuit TV unit brings multi-classroom instruction using audio-visual techniques within the reach of every size school and plant. With this new equipment, a single instructor can combine live instruction with video-taped lessons, films, slides, photographs, charts, and other graphic material. 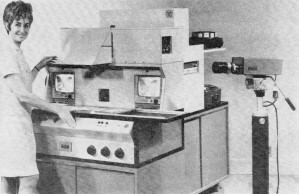 The resulting program can be transmitted live or recorded on video tape for later use. The teaching unit combines two TV cameras and standard audio-visual aids with simplified up-front controls. The basic studio, called WAVE (Westinghouse Audio-Visual Electronics), will sell for about $12,000. A companion recorder for video and five different audio tracks is also available separately. The studio is easily adapted to microwave transmission of programs to remote areas or to CCTV. Laboratory on Wheels. A 40-foot trailer, chock full of electronic recording equipment, is helping nuclear physicists at the Argonne National Laboratories look deeper into the atom. The traveling lab serves as a mobile recording center for advanced atomic experiments conducted jointly by Argonne and the University of Chicago's Enrico Fermi Institute for Nuclear Studies. The study is devoted to a detailed analysis of the beta decay of the lambda particle and utilizes Argonne's 12 1/2 billion electron volt proton accelerator, the second largest unit of its kind in the country. The trailer, built by Brown Trailer Div., is equipped with a 5-ton air conditioner and acoustical-tile ceiling to provide a cool, clean quiet environment for the lab. "Canned" Weather Satellite. 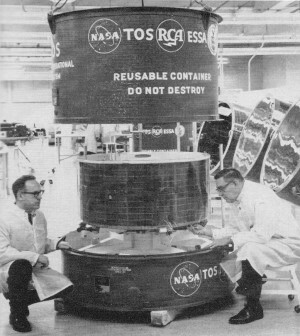 The engineers shown here are giving a new Tiros Operational System (TOS) weather satellite its final check before "canning" it for shipment to the Western Test Range in California. The satellite is to provide daily global coverage of the earth's weather. Now in orbit, it is known as ESSA 4 and is taking over from ESSA 2, which has been in orbit over a year. Additional Tiros weather satellites are on the assembly line at the RCA Space Center in Princeton, N.J. for replacement. Eight Military Communications Satellites in a Pod. 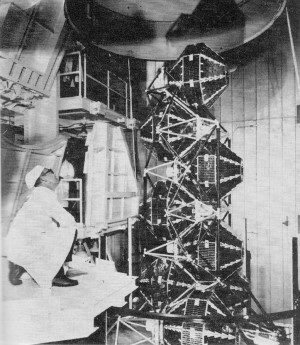 (Below) A protective shroud is being lowered over this group of communications satellites at Cape Kennedy prior to launch last January. The eight were hurled into space by a single rocket to complete the nation's first global military communications satellite network. 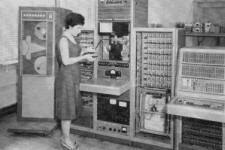 The new Philco-Ford satellites joined seven others that were orbited last June to form a radio network that will permit the Pentagon to contact our military forces located in Vietnam and elsewhere. Optical Scanner Reads Weather Data. An improved model of a film optical sensing device for input to computers has been completed by the National Bureau of Standards for use with computers of the National Weather Records Center in Asheville, N. C. The device reads data on past weather conditions from microfilms of punched cards and selects data to be tape recorded. This permits ready comparison of past and present weather data and should result in improvements in the weather predictions. Million-Volt Pulse Generator. (Below) The generator shown here, when triggered, can deliver a million-volt pulse with a risetime below 50 ns and an energy in excess of 100 joules. 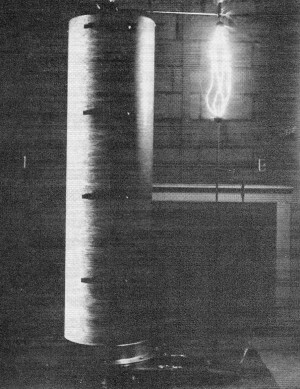 The instrument was designed as a research tool for the experimental scientist engaged in high-energy work. It also has uses in electronics, such as for antenna and surge-protector testing. Special safety and interlock features are incorporated to minimize danger to personnel. 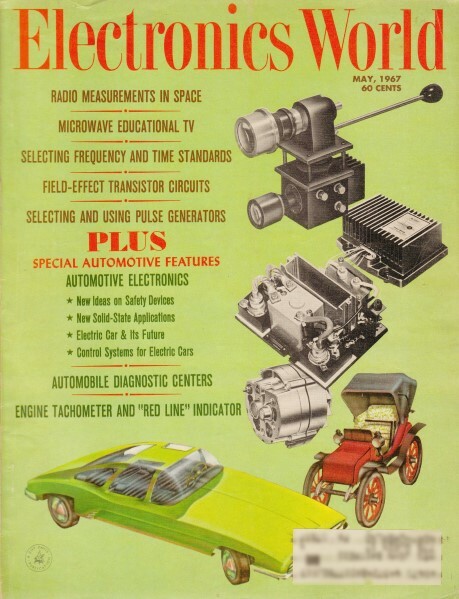 The generator, built by Instrument Research Co., sells for $12,000.